"More consistent crop thanks to ventilation and crop support"
Healthy roots are of paramount importance to having a healthy crop. However, threats are looming constantly. By offering better support to the crop bag and offering enough ventilation between the bag and the flow of drains, the Premium System with Hydroponic Systems conquers many of these. 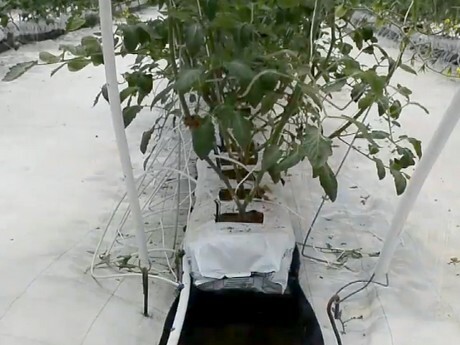 "Roots do not leave the bag, so neither drain holes are blocked by them nor roots are exposed to the outside, where they can easily be attacked by pathogens", a Mexican grower shares in a video update from the company. "Our Premium System has hundreds of customers all over the world", Maria with Hydroponic System says. "The system to collect drainages in hydroponic crops caused a sensation in the past years and has conquered the biggest producers in more than 30 countries." One of them is shown in the video. In the high-tech facility, over the last few years, they have used the Premium System. The Premium System incorporates the spacer (pat. ), which allows a perfect support of the crop bag and enough ventilation between the bag and the flow of drains. Thanks to the roots being better protected by the Premium System, root diseases and their contagion decreases, such as Fusarium. "The decrease in diseases means that: Plants can develop optimally, reaching their potential for growth and production, production costs decrease due to lower spending on phytosanitary products", Maria continues. The grower compares the use with that of the "Unicel" (seedling trays protected by a plastic sheath), very widespread in Mexico. "The use of Unicel presents big problems in crops that can lead to serious losses in production and therefore to great economic losses. Roots come out of the crop bag, drainages cannot flow properly so puddles are formed under the crop becoming a diseases focus." Meet Hydroponic Systems at Fruit Logistica, Hall 8.1, Stand A-16.